News of the Amtrak train derailment Tuesday night was just the latest example of how smartphones and social media have expanded opportunities for the public to not only consume and share local news, but to participate in journalism. Indeed, reports of how passengers escaped from overturned rail cars, as well as other recent local-turned-national news stories such as the Baltimore police protests, have included widely circulated bystander photos and videos. But to what extent is the public directly engaging in acts of journalism? A March 2015 set of Pew Research Center case studies, along with past research on the subject, suggests that it’s a small but measurable share. We asked residents about the actions they take to gather, share and add to the news in their communities. In three cities — Denver, Macon, Ga., and Sioux City, Iowa — we found that residents were more likely to share news than to post or submit their own. In Denver, 54% of residents had shared a news story through a digital channel (such as email or social media) in the past year, as did 40% in Sioux City and 36% in Macon. But no more than one-in-ten residents of each city had submitted their own local news content to a news outlet or website. We also asked a smaller subset of residents — those who say they get local news on a social networking site — about their sharing and posting behaviors on social media. Here, a similar pattern emerged: Twice as many often share or repost local news stories, images or videos (30% in Denver, 28% in Macon and 30% in Sioux City) as post photos or videos that they themselves took of a local news event (16% in Denver, 15% in Macon and 15% in Sioux City). Another national survey we conducted in 2014 found a similar gap: Half (50%) of U.S. adults who are social-network users share or repost news stories, videos or images. But fewer post photos (14%) or videos (12%) that they themselves took of a news event. The finding that sharing is more common than newsgathering is not an entirely unexpected or new development. A 2011 national survey on local news behaviors found that 25% of adults share links to existing local news stories or videos, while just 5% contribute original articles, opinion pieces, photos or videos about their local community online. It’s always been far easier to share than to produce original reporting. The question is whether advancements in mobile technology and live video streaming apps like Periscope and Meerkat could make newsgathering and distribution easier for public participants. And, of course, bystanders have to be in a position to have information to contribute to the news. But at least on one fundamental level, the public clearly plays a large role in the local news ecosystem. 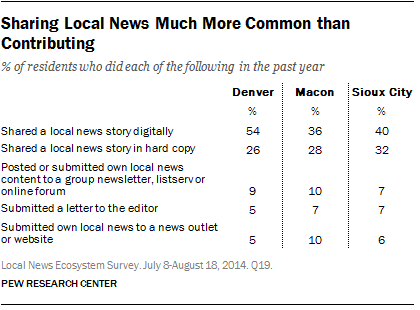 In Macon, more than a third of local residents (37%) rely on neighbors and friends for local news, about the same share who use the daily newspaper (36%). In Denver, a similar parity exists. In Sioux City, while the daily newspaper is used by more residents, other community members nevertheless rank as the No. 3 source for local news. These findings again echo the 2011 local news survey, which found that 55% of U.S. adults reported getting local news and information through word of mouth at least weekly.